Featured / Recipes / 07.05.2016. What are makači? 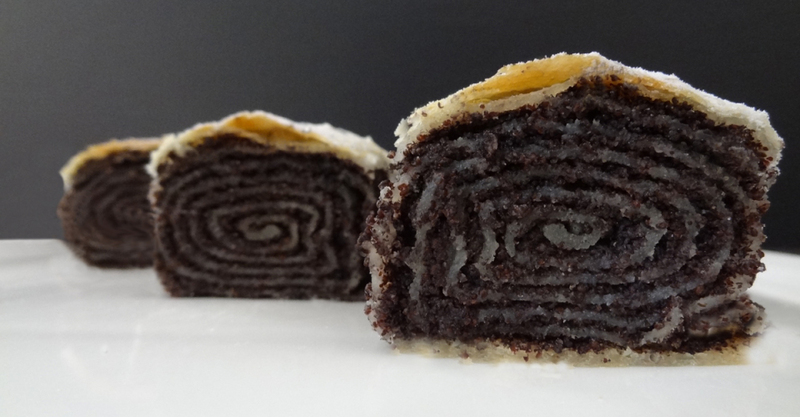 In simpler terms, poppy seed strudel which is traditionally prepared in Trnovec Bartolovečki, in the vicinity of Varaždin. Fine, thin layers of poppy filling and filo pastry provide a rich and juicy dessert. Sieve the flour, add salt, oil and water. Mix the ingredients for 15 minutes with an electric mixer until you get a mid-hard pastry. Form two balls, coat them with oil on both sides, cover with plastic foil and let stand for about an hour. For filling, mix the poppy and sugar. Warm up the milk in a deep dish and dissolve the butter. When it boils, add poppy with sugar and cook briefly. Let it cool. Gradually add cream into cooled poppy seeds with constant mixing. Use your hands to further thin the pastry (pull the pastry towards the edges of the table using the back of your hands). Evenly distribute half of the filling in thin layer onto the three quarter of the pastry. Pour some butter onto the remaining part of the pastry. Cut the edges. Fold the edge of the pastry very thinly over the filling. Then using the tablecloth roll the pastry in order to get a strudel. Even out the thickness of the strudel and cut to the size of the baking pan. Move it onto the greased baking pan. Repeat the procedure with the other ball of pastry. Use the cream to coat the strudels and bake them for 55 minutes in an oven previously heated to 180 °C (356 °F). Leave the strudel to cool. Sprinkle with powder sugar and cut.